You might remember the Mitsubishi Eclipse sports coupe. Production ended years ago, but Mitsu clearly sees potential in the name and the concept. That potential ended up in the form of a new crossover from the Japanese automaker. 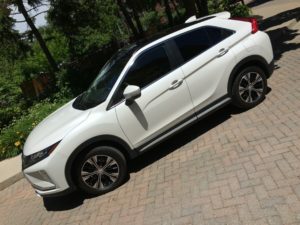 I spent a week with the Mitsubishi Eclipse Cross SE in Diamond White. Looked at from the side, the Eclipse Cross looks like a sprinter crouched in the blocks, not unlike its sports car predecessor. Elements like the body sculpting and the rakishly angled rear window make the Cross look like it’s perpetually leaning forward. 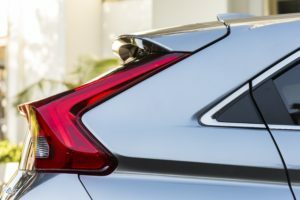 The rear end features lights that connect across the rear window with a brake light “bar.” The bar and the metal of the tailgate below are separated by a black section. I’ll come back to that black section shortly. When I pressed the button on the door handle, the side view mirrors swung out into position. They swing inwards when you lock the vehicle, and when you press a button inside the driver’s side door. Heated bolstered seats, a solid steering wheel, glossy and piano black accents and other quality touches add up to a fine first impression. Look up and you’ll see the two-part panoramic sunroof. Unlike too many vehicles, this sunroof does not oblige us taller drivers to lean back, bend our heads to one side or otherwise cram ourselves under a low ceiling. The rear seats proved comfortable and roomy for a couple of passengers who rode back there. When you get into the driver’s seat, look in the rear view mirror. You’ll understand something that the back window, separated by the brake light “bar,” only hints at. The bottom section enables a deeper rear view than what most vehicles offer. Thanks to the downward sloping bit of the fabric privacy cover, you can see much lower on the road behind you that in a typical SUV. 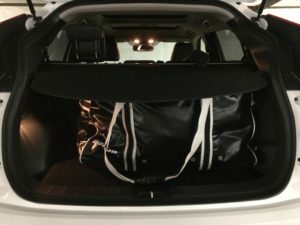 The bag fits without any need to lower the rear seats. Getting it by the angled flap of the privacy cover is the only minor inconvenience when stuffing it into the hatch. Sticks slid easily over the rear seats. You get to the rear tire and other compartments under the hatch floor. 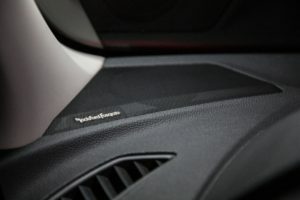 Mitsubishi thoughtfully threw in a hook on a cord under that floor that you can use to attach the floor to the hatch rim. This simple and useful setup reminds me of metal rods used to keep a vehicle’s hood raised. The Mitsu’s 7” touchscreen is easy enough to figure out, but it’s also mounted on top of the dashboard. That places it within a driver’s peripheral vision, but out of reach of most drivers’ hands. 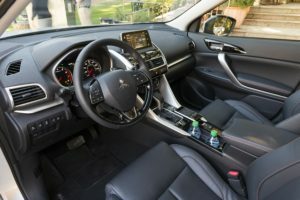 So Mitsubishi joined other automakers and added controls that reside just in front of the gearshift lever. A trackpad dominates this assembly. Fortunately, Mitsubishi includes a trackpad tutorial as one of its home screen apps. The tutorial quickly spells out basic swipes that any smartphone or trackpad user ought to understand quickly. These include swiping to go from one part of the screen to the next, from one track to the next, to raise or lower the volume, and other movements. (I found the tutorial on the last page of home screen options. I don’t know if that’s where Mitsu placed it or whether a reviewer who had the vehicle before I got it put the tutorial there.) Buttons around the trackpad, including now-standard Home and Back buttons, complete this interface. My tester did not include the optional heads-up display (HUD). 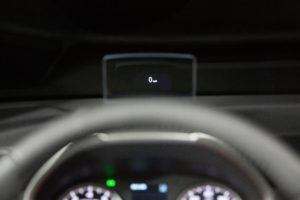 This consists of a “screen” that flips up from above the instrument cluster. 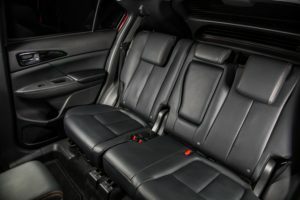 Mitsubishi is jumping on the in-vehicle assistance bandwagon with its subscription service, Mitsubishi Connect. 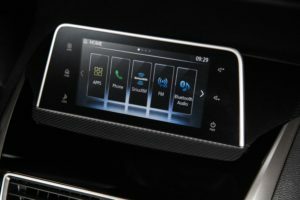 In-vehicle buttons trigger use of a built-in 4G LTE cellular modem to call either the SOS Emergency Assistance service or the Information/Roadside Assistance service. I stuck with Apple CarPlay for much of my time with the Eclipse Cross, plugging my iPhone into one of the two available USB ports. While the vehicle supports Android Auto, the trackpad doesn’t (yet) according to Mitsubishi’s documentation. 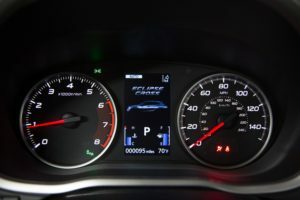 The multi-information display in the middle of the instrument cluster shows typical performance data, from the odometer to fuel economy to the drive mode indicator and so forth. Oddly, the toggles between different screens is not on the steering wheel, but on the dash behind it. That’s an inconvenient place for it, and I used it sparingly, not wanting to devote attention to these controls while the Eclipse Cross was in motion. Providing 152 hp and 184 lb-ft of torque, the 1.5L turbocharged engine proved peppy enough. Passing ability is more than adequate, thanks partly to how the 8-speed CVT downshifts quickly when you put your right foot down. Mitsubishi throws in paddle shifters in SE trim and above if you want to take control of the shifting. I use such systems to figure out how many gears a vehicle has when I first drive it on the highway, and let the automatic handle shifting from then on. Mutsubishi’s super all wheel control (S-AWC) ships standard on all trim levels. 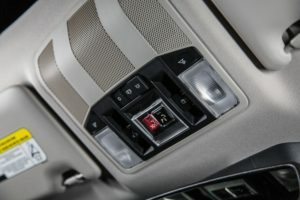 An S-AWC-labelled drive mode button near the automatic gearshift lever lets the driver switch to easy-to-understand settings like snow, gravel or auto. Unless you creep slowly through parking areas, you may get acquainted with the forward collision mitigation (FCM) system sooner rather than later. Driving slowly out of my condo, the Eclipse Cross hit the brakes as it approached the gate arm rising at its usual leisurely pace. The Mitsubishi would have cleared the arm – I’ve done so safely countless times before – but the FCM took no chances. On the upside, this system ought to prevent many low-speed collisions. The Eclipse Cross ships with as much technology under the hood as you’ll find in the cabin, although some of it ships only in higher trim levels and in certain packages. For instance, the $2,000 tech package bundles goodies like forward collision mitigation and adaptive cruise control (a personal favourite). Adaptive cruise control works as advertised. It adjusts smoothly to cars cutting in front of you and does not accelerate too hard when the road ahead clears. Don’t let the 1.5L size of the engine fool you. It still needs to propel a “compact” utility vehicle. Mitsubishi published city/highway/combined fuel consumption numbers of 9.6/8.9/9.3 L/100km. The Eclipse Cross takes regular unleaded fuel in its 60L tank. The Eclipse Cross SE-AWC goes for $29,998 MSRP. The base ES trim starts at $27,798.